This is arguably the best floor plan available in a bumper-pull toy hauler. 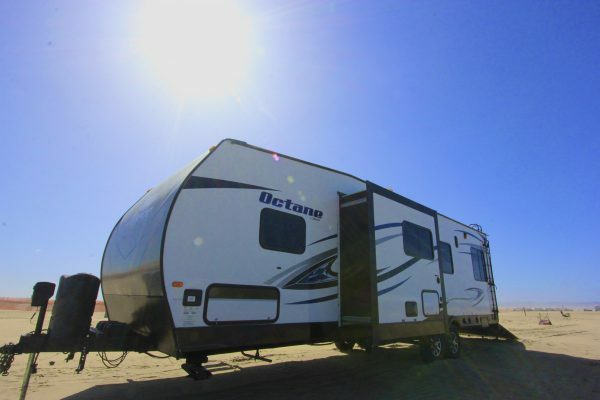 This is a newer unit with a side folding sofa and captain’s chairs, 2 rear motorized beds (bottom couch), and a front bedroom with a walk-around queen including private front bedroom entry door. It features a hallway for the bathroom entry and bedroom entry, with a secondary private bathroom door between the bathroom and the bedroom. The unit features nice features such as fiberglass siding, electric awning, and 2 TVs, one in the living area and one in the front bedroom. This unit can fit a Can-Am Maverick X3, huge rear garage area. Side couch (folds into bed) – Sleeps 6-8. Rear ramp door, 3,000# storage with tie down points. Electric tongue jack, leveling jacks. 102 Gal Fresh, 45 Gal Gray, & 45 Gal Black.